Making chocolate, one would think it is just a matter of mixing the right ingredients to get a good result. Less is true, actually it is a complex process consisting of several steps and each of these steps has a great influence on the taste of the final product. Two major steps in the production of chocolate, are the roast and the conche. 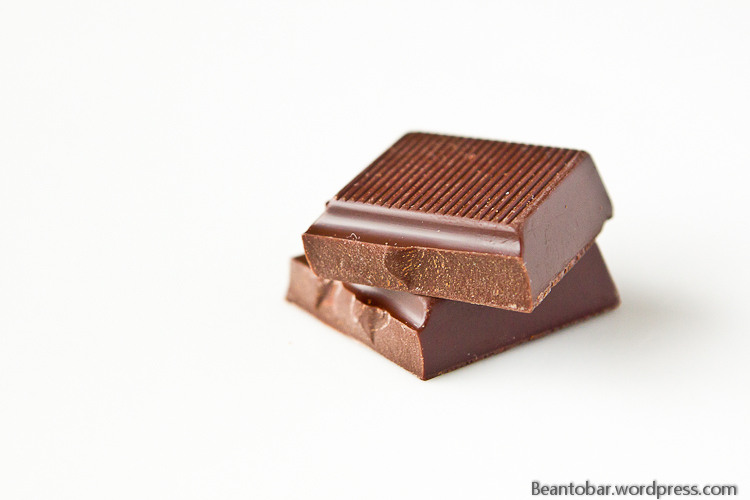 The roast takes away the acidic edge of the raw cacao beans, while adding chocolate flavors. Conching, or grinding the beans and sugar into a paste, further changes the taste of then end product by taking away aggressive notes and developing a more mellow taste. The chocolate maker plays with the roast and conche times in order to obtain the best result he can get. But just how much taste difference can one expect from changing the roast and conche, when working with the same base product? 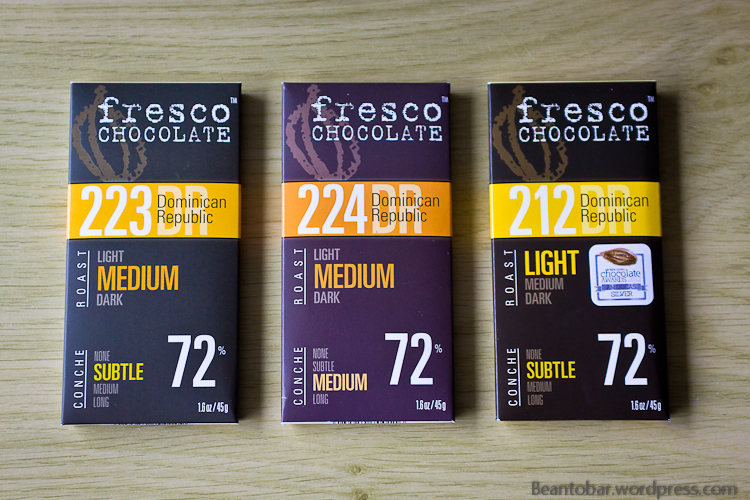 Rob Anderson, driving force behind Fresco chocolate, a small batch bean-to-bar manufacturer, gave me the chance to experience this first hand, when I won 3 versions of his Dominican Republic chocolate. 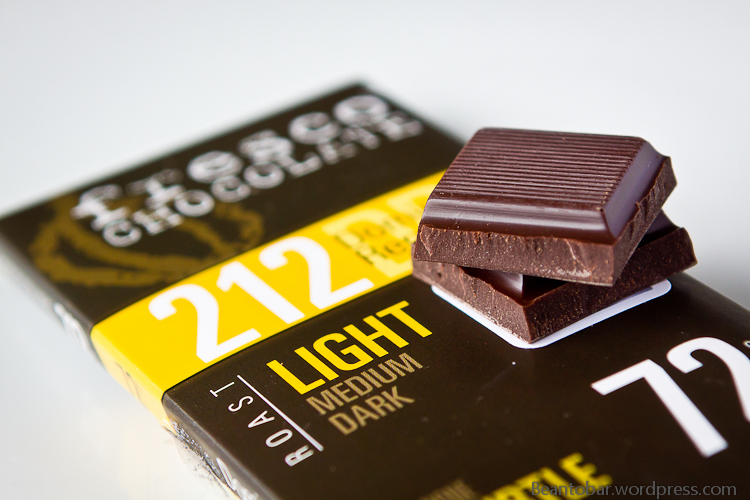 Type 212: Light roast + subtle conche – this should result in a chocolate revealing lightly softened raw cacao tones and aggressive flavor notes. 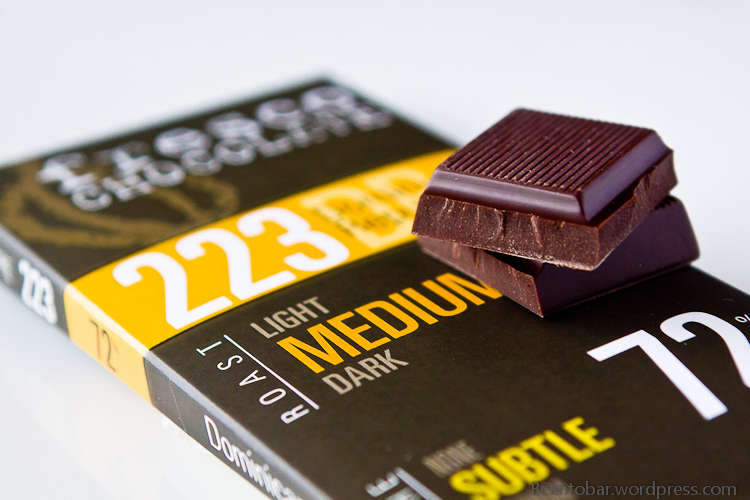 Type 223: Medium roast + subtle conche – expect a bolder chocolate taste while remaining the aggressive notes. 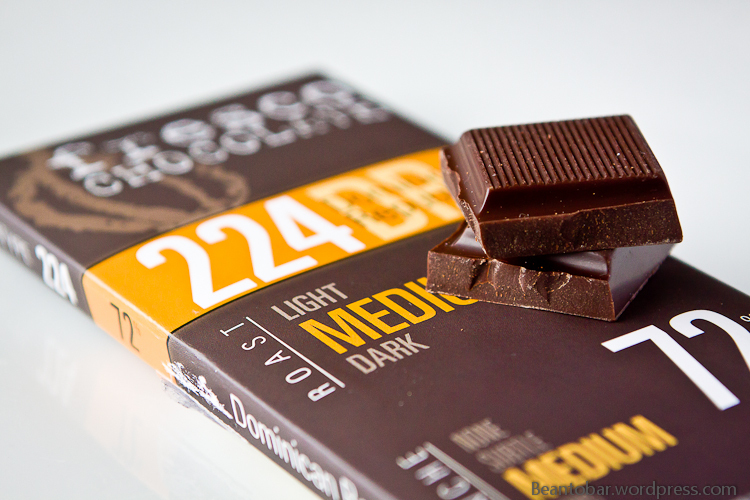 Type 224: Medium roast + medium conche – this should be a bold chocolate with a more mellow character. Colour: Somewhat surprising, this one is the least roasted, yet the darkest in colour. Full and deep ebony. 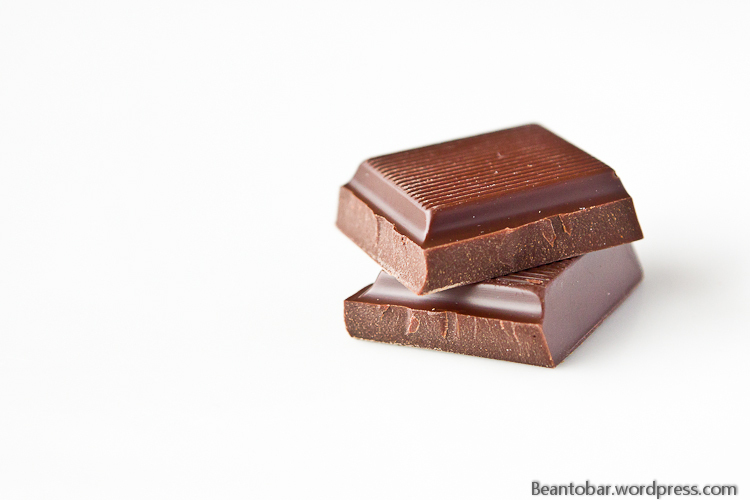 Taste: Starts a little dry in the mouth, before a gentle sweetness opens up a massive wave of cacao notes. Entangled in the aroma, delicate acidity mingles in, bringing the citrus flavors I noticed in the aroma. Somewhat harder to catch, but still present, is a more raw cacao acidity. Once again, the people at Fresco blow me away with the lime-like fruitiness which opens up the chocolate taste in a refreshing way. Almost hidden are some spicy notes. The texture is silky and the melt goes forth easily and it lasts just the right amount of time in the mouth to create a delicate symphony of notes, while not buttery at all. The aftertaste is a natural prolonging of the actual taste and it vibrates clearly on the palate, adding very subtle bitterness to the experience. In short? Fresh, elegant and refined! Wonderful stuff! Colour: Slightly more red and lighter in colour than the 212 receipt. 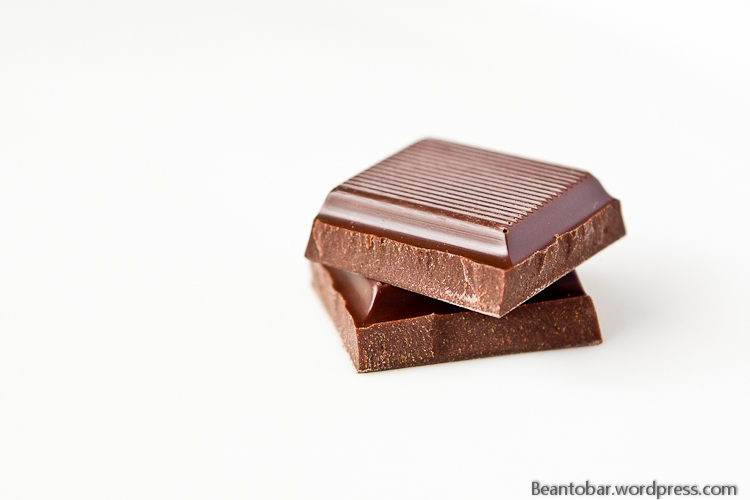 Aroma: This chocolate develops a more earthy aroma, with deep cacao tones. Almost made me believe this is actual a higher cacao percentage. Taste: Once more, a little dry at the start, the expected touch of sweetness, stronger than the 212, announces the next notes. Deep cacao takes overhand and fills the palates. Less fruit available here, but still it rings in the back. Coffee tones mingle with the cacao and a touch of molasses appear, warming up the entire taste experience. The fruit tones reminds me more of red berries than of the citrus in 212. Texture wise, this chocolate melts like a dream. The aftertaste rolls in with more pronounced bitterness and deeper chocolate notes than the 212. It’s pleasingly long! In short, this receipt offers a darker taste, a bit more powerful. Colour: Slightly lighter than the 212 and 223, though the differences are subtle. Deep chocolate brown for sure. Aroma: Some smoke appears now, but the aroma stays very close to the one of the 223 receipt. Earthy and powerful. Taste: Earthy start followed by a remarkable roasted aroma adding hints of smoke and espresso coffee. Somehow its a bit less sweet than the others and offers dark fruits mingled (cassis, blueberry) with the powerful chocolate taste. compared to the 223, the stronger roast comes trough more clearly and conching reduce the refreshing zing of the acidity, but add lots and lots of deep chocolate tones. It is one step darker than the 223, more masculine and bolder. It melts as good as the other variations, but is every so slightly more layering on the tongue. The aftertaste again extends the primary taste and brings a very satisfying aroma of very high quality dark chocolate and subtle bitters. Which one is the best? 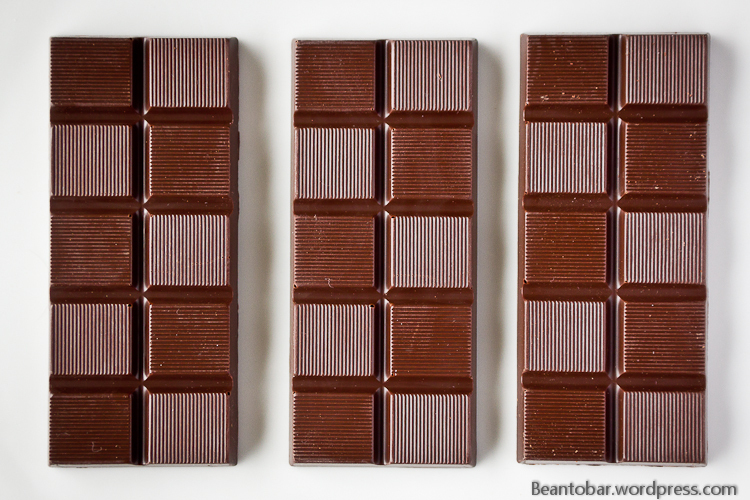 Hard to say, they all are superior products providing the delicate notes I love to find in fine chocolate. But if I really have to choose, I’d go for the 212. It’s fruit acidity shines like never before and reveals a bit of the powerful taste of pure cacao beans, while not forgetting about the amazing chocolate tones. These chocolates remind me of a warm summers day. 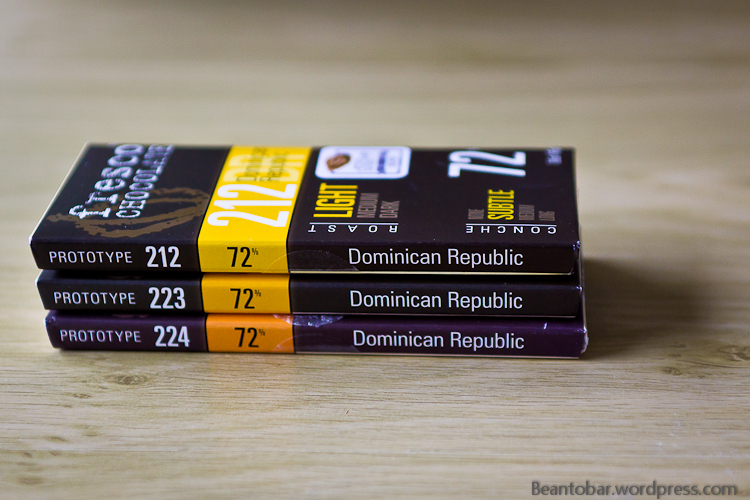 212 is the morning chocolate, fresh and zinging. 223 brings a warmer, bolder taste, like noon on a hot day. And 224 finally represents a sultry summer evening with an exciting night in sight. So, is chocolate different when made with different roast and conching? it is, crystal clear! It actually surprises me how much difference it makes. It is always a bit tricky to go on information producers place on their websites, but the info Rob provides on www.frescochocolate.com is exactly what you might expect when tasting his products. Highly recommended!